Morita Haruyo: our best-selling artist, her style a "fusion" of East and West. Her subjects are all kimono-clad beauties, ranging from the innocence of youth to the luxuriance of the courtesan. The panel above is made from the following two separate puzzles Dance of treasure and Dance of fortune. 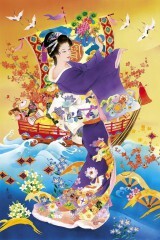 A courtesan in a gorgeous purple kimono dances, as the treasure boat sails by in the background, and an auspicious flock of cranes passes overhead. This puzzle forms a pair with the Dance of fortune (E11573): you can combine the two for a full-size 2000-piece puzzle. 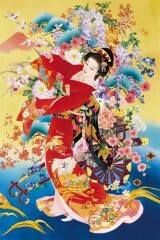 This courtesan has a bright red kimon, with a design including the "treasure" character (宝). She dances in front of an elaborate traditional cart bearing a splendid array of flowers and foliage. A red Mount Fuji in the background completes the scene with over-flying cranes (actually heading into the matching puzzle "Dance of treasure"). This puzzle forms a pair with the Dance of treasure (E11572): you can combine the two for a full-size 2000-piece puzzle. This Haruyo series began appearing in late 2009. This "scroll" puzzle combines the separate "crane" and "turtle" figures in this series with a background of plum blossoms. The crane and turtle are both traditional auspicious symbols of happiness and longevity. It is said that if a crane lives to be 1000, a turtle lives to be 10,000. The subject is traditional enough, yet Haruyo gives it her distinctive contemporary, flowing touch, for a puzzle filled with interesting colours. A typical Haruyo figure has her ornate kimono decorated with butterflies — then many more can be found, almost camouflaged among the flowers. A geisha figure dreams of a lover... Her kimono is elegant rather than ornate, but there is also plenty of background interest in this image. Two young ladies, obviously of high class, one with a parasol gesturing elegantly, the other wrapping her arms in the long sleeves of her kimono in a way so familiar in an era long gone. The title is part of an old saying, which describes the perfect female figure: "Stand like a shakuyaku, sit like a botan, and walk like a lily." This does not work very well in English, because the first two are both varieties of peony: shakuyaku is Paeonia lactiflora, or the common garden peony, and botan is Paeonia suffruticosa, or the Chinese tree peony. But Haruyo makes everything clear: not only with the floral kimono, but also by surrounding the figure with a mass of peony blooms. Not to meet in real life is hard enough, but for cares to keep you from me even in my dreams is more than I can bear. This is a synthesis of the figures from the separate Starflower and Moonflower puzzles, making an interesting composition for a 500-piece puzzle. The modern hairstyle shows this to be a contemporary beauty, and spring is the setting given by the yellow yamabuki blossoms ("kerria" in horticultural circles). (Update 2008) Haruyo now lives in Australia, where she has her own website. We now have the complete Haruyo catalog in stock, except for the slight delay in getting the latest displayed on the website. For reference: you can view all the Haruyo puzzles that are out of print in the Attic.